I remember it like it was yesterday. I remember being 17 and pregnant. I was afraid. I was unsure of what the future would hold, I was unsure of what the next week would hold. But one thing I did know for sure, I was not alone. While I felt the judgmental glances and heard the criticism by some, even in the church, I was blessed to have a large support system standing right beside me. I was blessed to have an incredible man who very soon became my husband. Almost 20 years later, our little unexpected family has grown and we are blessed. So many women have stories that don't end like mine. They don't have a support system. They don't have people who embrace them, offer grace and walk beside them through this journey. They truly feel alone. When a woman without a support system unexpectedly finds herself pregnant, regardless of her age, she is far more likely to turn to abortion. Ending the life of someone, a human being with a purpose from God, is never an acceptable choice. Period. Yet, sadly, too many women feel it is their only option. Embrace Grace is an incredible organization formed for the purpose of providing emotional, practical and spiritual support for single, young women and their families who find themselves in an unexpected pregnancy. Their primary goal is to empower churches all across the nation to be a safe and non-judgmental place for young ladies to turn to when they find out they are pregnant, instead of being the last place they are welcomed because of shame and guilt. They provide curriculum and resources for churches to implement their programs and become not just a Pro Life church, but to become a Pro Love church. If the church, the Body of Christ, would join together and support these young ladies who choose life, young moms will be more open to not aborting their precious babies. Whether they choose to keep and raise their baby or choose to place their baby up for adoption, Embrace Grace is a support system for them as they begin their journey. It's time for churches to not only advocate life and discourage abortions, but it's time to support these courageous moms and give them guidance and direction in a loving way. My favorite part of Embrace Grace is the Love Box! These boxes are given women who choose life. 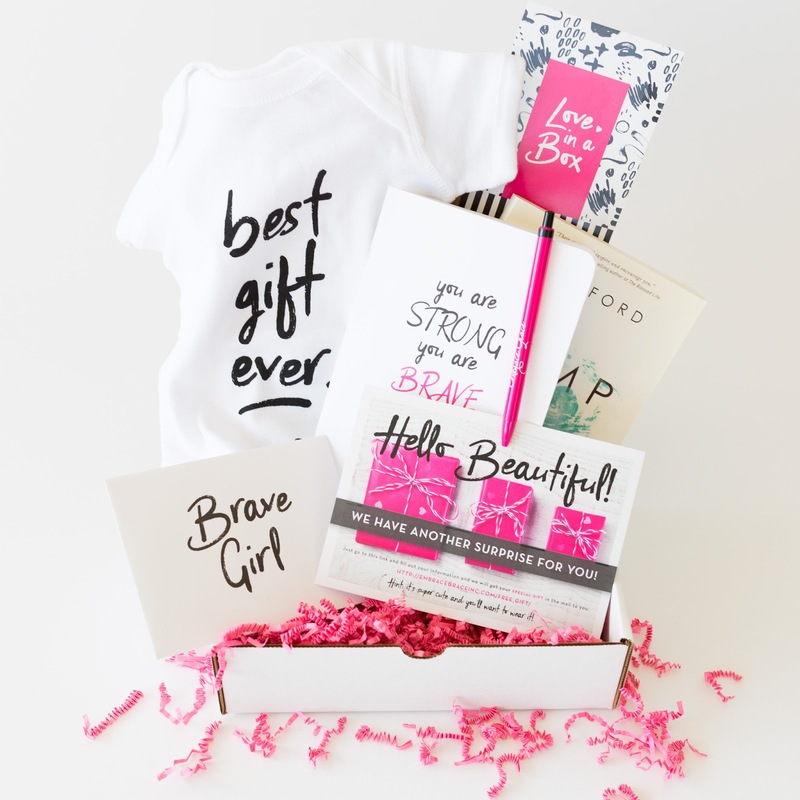 Each branded box includes a "special gift" postcard, a "Dear Brave Girl" letter, the "A Bump in Life" book, "Best Gift Ever" onesie, brave journal, and a free gift offer if they reach out for help! But the best part is the "Dear Brave Girl" letter. Why is it the best part? Because YOU get to be involved! You get to write a letter to a young woman speaking life into her and encouraging her. Your hand written letter will be placed in a box. Think of the seed you would be planting and part you will be playing in this new little family! Like what you are hearing about the ministry of Embrace Grace? Would you please pray about making a donation? Embrace Grace sends FREE Love Boxes to pregnancy centers all over the nation. Each box has a cost to Embrace Grace of $35. To sponsor a box, or boxes, click HERE. 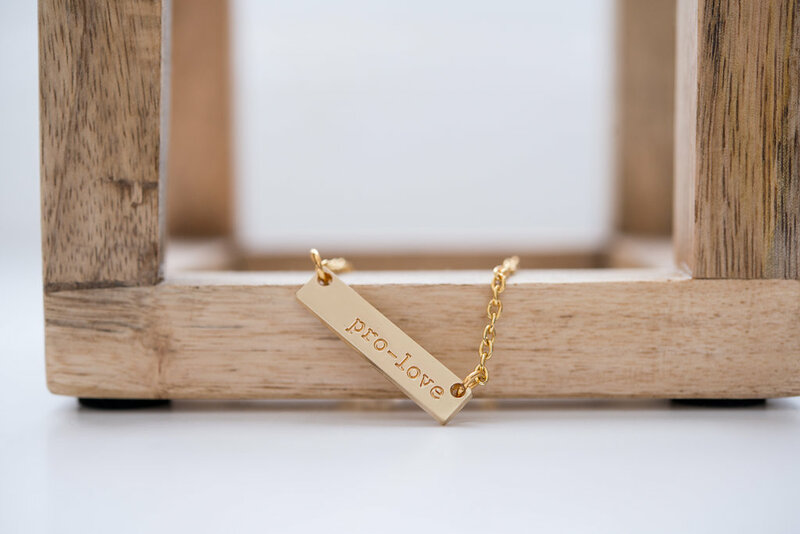 Check out this beautiful Pro Love necklace. When you shop for this and other Pro Love merchandise, you are supporting the the mommies and babies who are touched by Embrace Grace.